You Don’t Have to Ride a Dark Horse to run away from, er read Hungry Ghosts! Author and chef, Anthony Bourdain (Kitchen Confidential) and novelist Joel Rose are back with more culinary shenanigans in Hungry Ghosts. 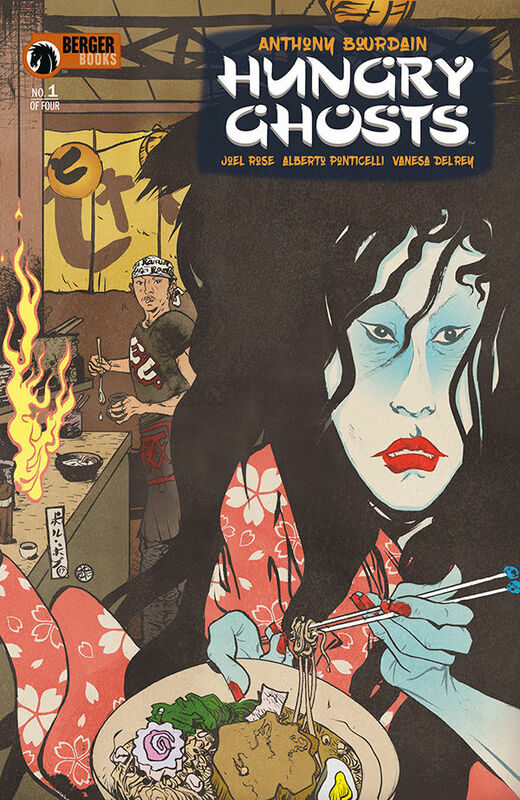 They wrote Get Jiro!, a send-up about food culture for DC/Vertigo six years ago and their play on words with this new title (published by Dark Horse Comics) is not a send-up on the traditional meaning, where ancestral spirits are forgotten by future generations. With this new work, veneration is explored in a different sense. On a dark, haunted night, Mr. Fedachenko, a Russian oligarch dares a circle of Michelin star international chefs to play the samurai game of 100 Candles—where each storyteller has to tell a terrifying tale. Each of them better pray they can survive the challenge. This game is not like Russian Roulette. Instead, it’s a test of courage and perhaps a means to summon the undead. By the time the last candle is blown out, the hope nothing demonic is present. Issue #1 is due to hit stands January 31st. In my preview, I was salivating over the modern delights of this retelling and modernization of supernatural lore from Japan. I find this culture’s — and my own (China) — take on the paranormal far more phantasmagorical than their Western cousins. Nothing against Europe and the gothic tradition, but in Asia, the often colourful and misty backdrop makes for a far more worrisome world for mortals to live in. In Japan, this world is revered. In Europe, it was often feared. In the narrative Bourdain and Rose fashioned, we have a new crypt keeper. She does not reveal her name, but by the title alone, Kaidan is inferred. Unlike the host from Tales from the Crypt, there’s an enigma in her tone and she appears in the last frame before the first tale unfolds. 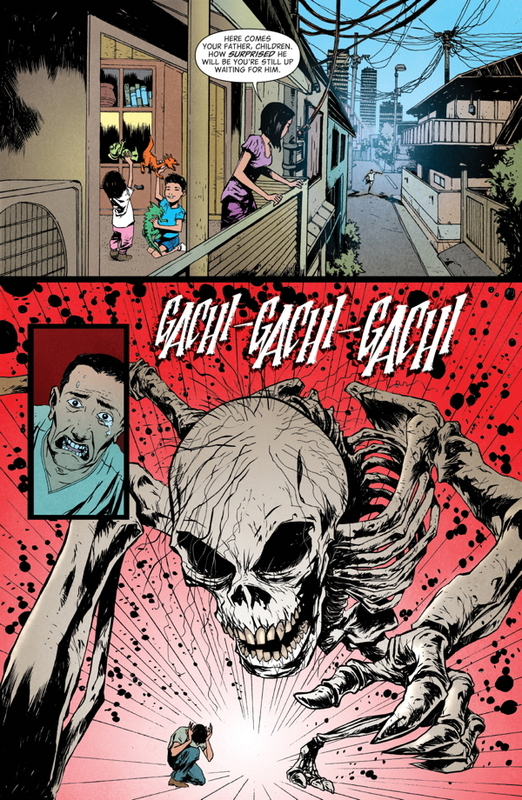 With “The Starving Skeleton,” a gashadokuro appears to teach a ramen chef a lesson. There’s a simple morality tale here, and this supernatural creature’s origins needs no explanation because it’s effectively conveyed in the story. This work is spectacularly rendered by Italian artist Alberto Ponticelli. In “The Pirates,” perhaps what these sailors pulled out of the sea is a female ningyo. To say more will spoil this beautifully illustrated short by Vanesa Del Rey. Unlike the explicit erotica found in scrolls, this work is more suggestive. The colouring work by Jose Villarrubia adds a rustic flavour to this piece. The tough part of weighing in on this four-part series is in whether or not four issues is enough to catalogue Japan’s vast collection of stories. Thankfully, the afterward hints at instead of trying to tell them all, the tales will be set all over the world. A limit is set in how many scares can be told. Japan and the Carribean are covered. Two countries are down, with six or seven more to go.